The McRaven house was built in 1797 by a man named Andrew Glass in the town of Vicksburg, which was called Walnut hills at the time. The house started off as a single room above a kitchen and functioned as a halfway house for travelers on their way to Nashville in Tennessee, this section became known as the pioneers section. The house was originally called the Bobb house during its civil war years and was later named as the McRaven house after the street it was built on, Mcraven street, which was later renamed Harrison street. The house had many modifications during its years including the building of a middle dining room and a bedroom after it was bought by a local sheriff, Stephen Howard in 1836. 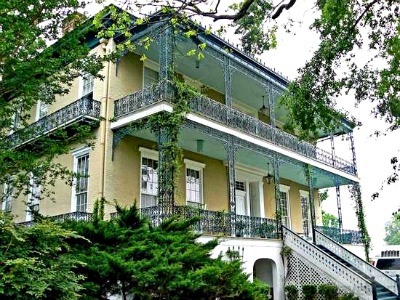 John H. Bobb bought the house in 1849 and made a number of other modifications to it. The house was then passed to a number of different owners over the years until in 2007 the house stopped doing tours and was put up for sale. One of the former owners of the house, John Bobb, was murdered by union troops only 100 yards from the house after getting into an argument with 5 of them who were picking flowers from his garden. He was shot in the back and face and died instantly. It is thought that he is the apparition that people have seen standing in the garden of the house admiring the flowers before fading into nothing. Ghosts of confederate soldiers have also been seen around the outside of the house, and are probably those that died here while the house was used a field hospital during the war. The main ghost in the building, or at least the most active seems to be that of Mary Elizabeth Howard who died during childbirth at the age of 15 in the middle upstairs bedroom. It is thought that she is responsible for the lights in the house turning themselves on and off at will. Many people and neighbors have reported the lights within the building turning on at all hours, even when they know no one is inside. Her apparition has been seen on the flying wing staircase in the house, were she has been seen walking up or down the stairs before disappearing when reaching the last step. Another interesting thing about Mary, is that her wedding veil is still within the house and various guests have reported various things while holding it, from feeling ill or an unexplainable heat coming from the veil, to it jumping straight out of their hands. Who or what the other ghosts that reside in the house seems to be something that will forever remain unknown, but their activity can be felt all over the house, from the bottom of the garden right through every room and into the attic.